What more can we say about this man? No words are enough to define the little Argentine's genius. Lionel Messi has been playing like a man possessed this season. His consistency in front of goal has been astonishing by any standard. After a disappointing World Cup, the 31-year-old has started looking like his old self this season for Barcelona. Barcelona are currently top of the LaLiga table, and that has as much to do with Messi's impeccable form in front of goal this term as anything else. He has been the driving force behind Barcelona again, but to an even greater degree than before. Messi has been Barcelona's chief creator and chief scorer this season in the domestic league. He has scored 25 goals this season and is currently leading the charts for the Golden Boot. He has also assisted 11 this season, which tells you just how much of an all-round player he is. The 31-year old has been the best dribbler in Europe's top 5 leagues as well, with 4.5 successful dribbles per game. Messi's stats in the Champions League aren't bad either, to put it mildly - he has scored 6 goals and assisted 1. In Copa Del Rey, he has scored 2 goals and assisted 2. So in total, Messi has scored 33 goals and assisted 14 this season. And we are still only in February! Regardless of the stats, the Argentine has been Barcelona's Man of the Match in almost every game he has played. He has been literally everything for his team; on many occasions this season, Messi has dragged Barcelona to a victory almost single-handedly. 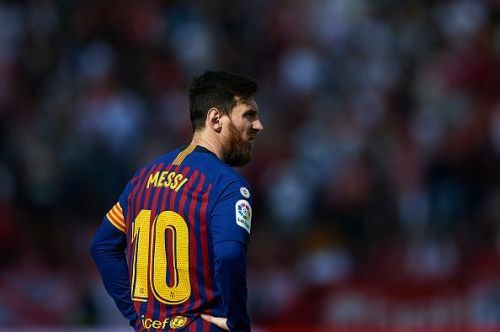 The most recent example of that was the match against Sevilla, where Messi scored a hat-trick and assisted another - thus contributing to all the four goals that Barcelona scored. This was the Argentine's 50th career hat-trick, which means he has scored 150 goals in just hat-tricks. The consistently brilliant performances and statistics have been matched by almost no one this season, not even Cristiano Ronaldo. Right now, many fans would argue that Messi is currently playing better than he ever has. Is he the best player in the world at the moment? The more pertinent question is whether he is the best ever.